Things are going very well at Bethnal Green Ventures. So well in fact that we’re looking for some extra help as we step up another level in the next year. 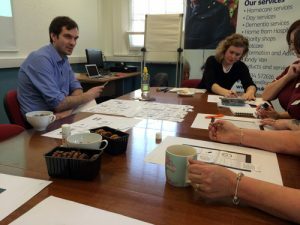 A quick recap: we’ve grown from our origins running Social Innovation Camps to become an accelerator offering investment and support to amazing founders who are building startups that make a real difference in health, education and sustainability. 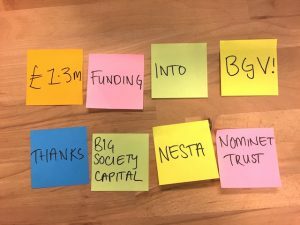 With support from Nesta, Nominet Trust and the Cabinet Office’s Social Incubator Fund we’ve created one of the best accelerators in Europe for early stage startups working on tech that matters. We’ve now supported 42 ventures including DrDoctor, Fairphone, I Can Make, Mastodon C, Open Utility and many more. We currently invest around £400,000 per year. But we want to do much more. Our plan is to grow our offering, providing follow-on funding and even better support to our ventures who we think will increasingly come from across the world. We’re looking for an amazing new Chairperson of our Board to help us do it. Our board is currently composed of two executive directors and three non-executive directors. We want to consolidate our governance and make it better, building on our successes. 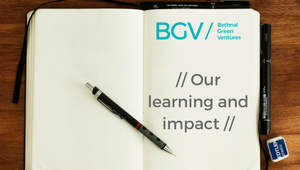 Our vision is to make Bethnal Green Ventures the best place in the world for founders who want to use technology for social good. Can you guide us on that journey? Drop us a line (to paul@bethnalgreenventures.com) telling us a bit about yourself and how you think you can help by the 10th October 2014. We particularly welcome applications from women.